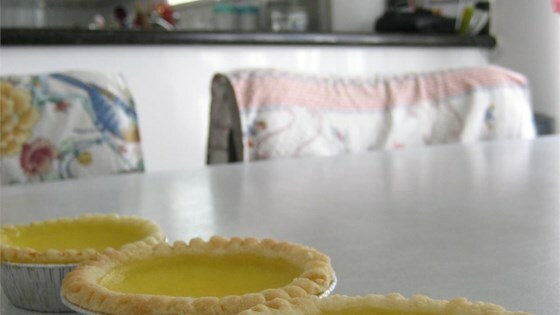 "Very easy to make Chinese style Egg Tart, you can put the leftovers in the refrigerator for later use for up to 3 days. You can reduce the sugar used on the crust and the filling to fit your taste, this recipe is lightly sweetened. If you want to you, can add more sugar to the filling. Hope you enjoy it!" In a medium bowl, mix together the confectioners' sugar and flour. Mix in butter with a fork until it is in small crumbs. Stir in the egg and vanilla until the mixture forms a dough. The texture should be slightly moist. Add more butter if it is too dry, or more flour, if the dough seems greasy. Shape dough into 1 1/2 inch balls, and press the balls into tart molds so that it covers the bottom, and goes up higher than the sides. Use 2 fingers to shape the edge into an A shape. Whole milk will work as a substitute for evaporated milk. the egg custard was good, taste just like the ones from the chinese bakery shop. however, the pastry is somewhat flat - suggest using cake flour instead of plain flour for added fluffiness. This recipe was a failure because the temperature was way too high...my eggs were overcooked and chewy. I was so disappointed.